Lately I’ve been making more of an effort to try out different foods and going to restaurants when I really feel like it’ll be a great experience, rather than just eating out for convenience. Using a Bloomspot discount coupon from Hubby’s colleague, we went to Albona Ristorante last Thursday. Located in a residential part of North Beach, it’s a small restaurant serving Istrian cuisine. What’s Istrian cuisine you ask? It’s a blend of Italian, Austrian, Hungarian, Slavic, French, Spanish, Greek, Turkish, and Jewish foods. This blending of cuisines is a reflection of the many groups that have ruled the area. Old empires such as the Venetian, Austrian and French have all ruled the region. Some years later it became a part of Yugoslavia and with the breakup of that country, the peninsula is now shared by three countries: Italy, Croatia and Slovenia. Albona, located in what is now Croatia, is a small town on the eastern side overlooking the Adriatic Sea. Areas with such a dynamic history is bound to produce at least one good thing out of its chaos: an unique cuisine that cannot be found anywhere else. Such was the case at Albona Ristorante. It’s a small restaurant. With just a few tables, the dining area is the size of a standard apartment’s living room. The waiter and servers were all very helpful and nice. Taking our coats and deftly taking the coupon out of Hubby’s hand without a word. We got pan-fried gnocci, asparagus soup, corvina with vegetables, braised rabbit with polenta, and tiramisu. 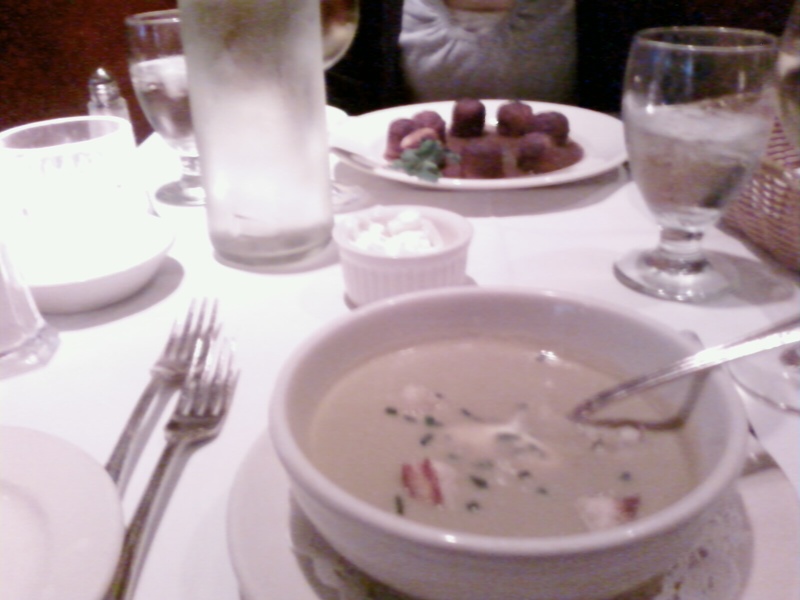 I thought everything was great, with perhaps the asparagus soup an exception as it seemed too bland for me. Forgive me but my camera (not like that one was that good) is currently out commission and we have yet to get a new one, so the following crappy pic was the best we could do. For those wondering how these dishes are different from standard Italian fare, the menu also had items such as sauerkraut, red cabbage and sausage. While we enjoyed our night, I’m not sure if I would go back given the highish prices even with the coupon. As the night went on, there were several people who were not able to sit immediately (and I assume they all made reservations) so we were lucky that we showed up early for our early evening reservation made for earlier in the evening. I’m not sure if this has anything to do with eating the rabbit but the next night I had a nightmare of walking through an area full of dead puppies, puppies whose decaying bodies were spread out very much like the rabbit at Albona! I also just looked up corvina and the Monterey Bay Aquarium has them labeled as a fish to avoid because of threat of extinction. Imagine Hubby’s face when I told him! Oh well food is food. Our next planned restaurant outing is to Chez Panisse Cafe so I can’t wait for that.